CORPUS CHRISTI, TX – Prepare now for your summer job as a lifeguard! 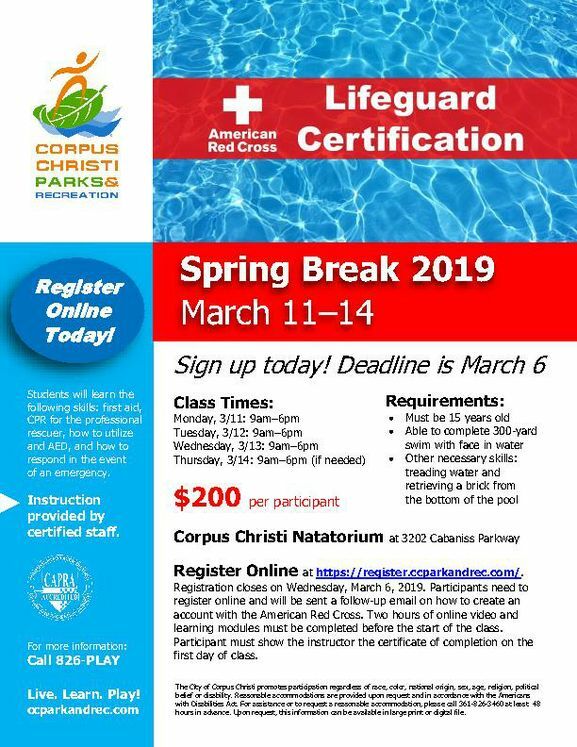 The City of Corpus Christi Parks & Recreation Department will be offering a Lifeguard Training Course during spring break. It will be held Monday–Thursday, March 11–14, 2019, from 9am–6pm at the Corpus Christi Natatorium, located at 3202 Cabaniss Parkway. This course teaches the duties and responsibilities of lifeguards to prevent and respond to aquatic emergencies and procedures to carried out in a professional manner. It certifies participant in Lifeguarding/First Aid, CPR/AED for Lifeguards, Oxygen Administration, and Bloodborne Pathogens Training. Students must be at least 15 years old and pass the skill test that will be held prior to the class. Pre-requisite skills are as follows: ability to complete 300-yard swim with face in water; treading water; and retrieving a brick from the bottom of the pool. REGISTER ONLINE at https://register.ccparkandrec.com/ now through March 6, 2019. Cost is $200 per participant (includes book and materials). There will be a $25 late fee applied to persons who register after the registration deadline, space permitting. For more information, call the Aquatics Office at (361) 826-1749 or (361) 826-3460.